Trafalgar Wharf: Captain Horatio Pugwash, awaiting your orders…. You may have seen Captain Pugwash sitting lonely at The Drystack. He has lost his ship, the Black Pig, and all of his crew so he is after making some new friends and would like to get back out to the Solent. Take him to Gunwharf Quays for the fireworks on Friday 2nd November or take him to the Christmas Festival at Portsmouth Historic Dockyard on the first weekend of December. You could even take him out using one of our days out guides and visit somewhere different. Make sure you take a photo of your adventure together and write about it in his ships log kept in the Drystack beach hut. 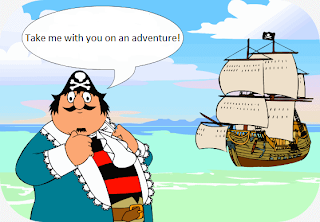 Please don't forget to return Captain Pugwash along with his logbook after your adventure, so that he can continue exploring!